In Iraq, masses began converging from the south and from Diyala province in the east on Baghdad, heeding the call of Shiite cleric Muqtada al-Sadr for a million-person demonstration to mark what the Sadrists and many Sunnis see as 8 years of American military occupation. April 9 is commemorated by the pro-American politicians as the day Saddam fell, but the Sadrists and Sunni oppositionists see it as a black day on which Iraq lost its independence to Washington. Small Sunni crowds in Falluja and in Adhamiya in Baghdad got a head start by rallying on Friday, chanting against the United States and saying it had imposed Iranian rule on Iraq (yes). Among the demands of the largely Shiite demonstrators planning to come out on Saturday is that no US troops remain in Iraq after Dec. 31, 2011, and that there be no US bases in that country. Despite falling out of the news in the United States only 6 years after this country was electrified by the parliamentary elections that brought the Shiite Supreme Council for Islamic Revolution to power, Iraq has continued to be a hot news story. Just a few days ago, Sunni Arab guerrillas set off a bomb that killed 55 persons in front of the provincial government building in Salahuddin Province, north of Baghdad in the Sunni Arab belt. In Syria, some 27 demonstrators were killed on Friday by security forces, and the government alleges that 19 police were killed by gunmen wearing ski masks. 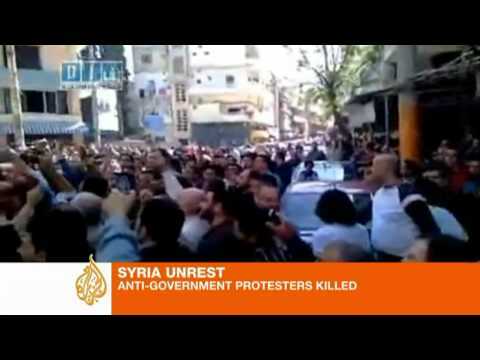 Rallies were held in Damascus, Douma, Deraa, Homs, Hasika, Qamishli and Banias, among other places. President Bashar al-Asad’s attempts to placate the 2 million Syrian Kurds by restoring citizenship rights to 100,000 of them were not entirely successful, since some 3000 Kurds nevertheless marched on Friday, insisting on a transition to full democracy. Deraa, the southern city which has seen frequent big demonstrations, was active again on Friday. Discontents there have to do in part with the government’s poor management of water resources and consequent lack of water. But Sunni fundamentalism opposed to the secular Arab nationalism of the Baath Party, which is dominated by the folk-Shiite Allawite sect, probably also plays a part. In Yemen, hundreds of thousands marched in cities throughout the country, demanding that President Ali Abdullah Saleh step down. He refused. In Taizz security forces killed three persons. In the capital of Sanaa, supporters of Saleh dueled with his detractors in rival demonstrations. In Egypt, some 100,000 protesters gathered in Tahrir Square in downtown Cairo, demanding that deposed president Hosni Mubarak be put on trial for corruption. Some also chanted against interim military leader, Field Marshal Hussein Tantawi, calling for him to step down. Tantawi had been close to dictator Hosni Mubarak. On Saturday morning, the army cleared those still remaining from the square with tear gas and by firing over their heads. A small crowd of 2000 demonstrated in front of the Israeli embassy in Cairo against Israeli air strikes on Gaza and the continued blockade of the Gaza Strip. The mainstream of Egyptian politics, however, continues to cling to the Camp David peace accords with Tel Aviv. The air strikes, which killed civilians were provoked in part by the militant party-militia Hamas firing rockets into Israel, including one that hit a school bus and seriously injured an Israeli teenager. In Libya, the see-saw fighting continued. The forces loyal to the Transitional National Council beat off an attack from the east on the western city of Misrata by forces loyal to dictator Muammar Qaddafi. NATO destroyed an arms depot under the control of the Tripoli government near the rebellious city of Zintan southwest of Tripoli. Aljazeera Arabic is reporting continued fighting at Brega and Ajdabiya. A man set himself on fire in Amman, Jordan, emulating the action of the Tunisian Mohamed BouAzizi, whose self-immolation helped spark the Arab Spring.